Washington, DC – After voting in favor of H.R. 1, the Tax Cuts and Jobs Act today, Congressman Adam Kinzinger (IL-16) released the following statement. “Our current tax code is over 30 years old and our economic growth is stagnant. 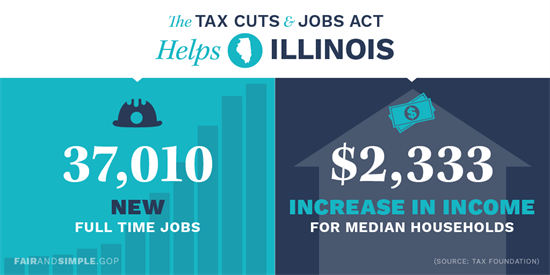 Today, I voted in favor of the House’s ‘Tax Cuts and Jobs Act’ to provide tax relief to families, small businesses, and individuals here in IL-16 and across the country, and to give our economy the jump start it so desperately needs. “Nearly 70% of IL-16 residents pay the standard deduction. This tax plan doubles the standard deduction, repeals the death tax, and consolidates tax brackets to put money back into the pockets of more Americans. According to the Tax Foundation, this tax plan will create more than 37,000 new, full time jobs here in Illinois. Families in my home district and around the country will benefit from a new family credit that helps with everyday expenses, and will also provide streamlined education benefits to help them save for and better afford college tuition and education expenses, including apprenticeships.